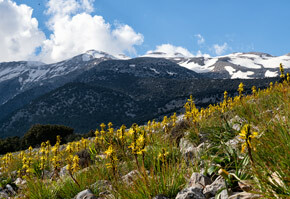 The walk through Samaria is not that hard if you are fit and used to walking but it can be a nightmare if you aren’t. But don’t worry! 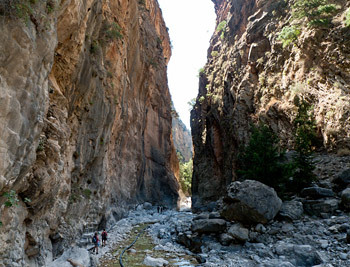 It is possible to see shorter sections of the gorge of Samaria if you don’t want to walk through the whole 16km of it. This is the most common alternative and is often offered as an excursion by tour operators under the name “Samaria Easy” or "Samaria Lazy”. You take the ferry from Hora Sfakion (it generally leaves at 10.30) to Agia Roumeli and come back with the afternoon ferry (times may vary but expect to be back in Hora Sfakion in late afternoon). You’ll get a nice coastal ferryboat ride but as you arrive in Agia Roumeli at 11.30 or 12.00 it will not give you much time to go and explore the lower part of the gorge unless you are willing to walk in a rush. Most people only get as far as the “Gates” before turning back to Agia Roumeli. Also bear in mind that you’ll be walking in the midday heat (with very little shade) and will also be walking contraflow to most people arriving from the top of the gorge. You guessed it: it’s not the best way to visit the gorge of Samaria. You could also take the ferryboat from Sougia (or Paleochora) to Agia Roumeli (there are probably no organized excursions offering this). The advantage is that the ferry leaves earlier and the journey is shorter so you will get to Agia Roumeli one to two hours earlier than if you were coming from Hora Sfakion. This gives you a lot of extra time to go and explore the gorge beyond the ‘Gates’ (where it gets really spectacular) with the added advantage of less heat because you are starting earlier and also meeting less people walking down. Once you have had enough (you could walk all the way to the village of Samaria if you walk at a good pace) turn back and walk back down to Agia Roumeli and catch your ferry back to Sougia (or Paleochora). By far the best way to visit the gorge of Samaria from its southern end is to spend the night in Agia Roumeli and walk into the gorge very early in the morning. It will be cool and shady and you will have the gorge more or less to yourself for the first few hours. You could easily walk all the way to Samaria if you wanted to, even if you need to catch the evening ferry out of the village. If you wanted you could of course carry on and walk all the way up to Omalos. But beware, the last 2 km of the walk ascend 600m so it’s a pretty tough end to a 16km walk. But easier on the knees than going down. If you come to Omalos by car and need to get back to it you can walk down the gorge as far as you wish and walk back up to Omalos. But beware, the return is pretty steep. It is also the only option that is allowed after around 13.00 where the National Park wardens will only let visitors walk down to Agios Nikolaos (around 4km) but not beyond (the idea being that you don’t have enough time left to get through the gorge during daylight hours if you start so late). If you are leaving your car in Omalos it is also possible to walk all the way down to Agia Roumeli then return by ferry to Sougia then drive back to Omalos by either taxi or public bus. Before you do this you’ll need to check that the ferry to Sougia is running (you can ask at the entrance post of the national park, they will know). You will also need to check if there are buses that return from Sougia to Omalos (this was a new thing in the summer and early autumn of 2015 so it’s not guaranteed that they will carry on in 2016). Either check their time-table (don’t do this long in advance, the time-tables shown are always the CURRENT time-tables, not the future ones). You could also email the KTEL (writing in English or Greek) and ask them. They are usually prompt at replying. Here again, don’t email a long time in advance. If there is no bus you will need a taxi (around Euro 50 in 2015). The drive takes about 35 minutes. You MUST reserve a taxi in advance as there are only two taxis in Sougia (see the Taxi section in this link for taxis in Sougia).